Therm-a-Rest LuxuryLite Cot Warmer. Featuring ThermaCapture™ Radiant Heat Technology, the LuxuryLite® Cot Warmer increases the temperature performance of your cot by 10-15 degrees, taking your cot from 1- to 3-season warmth. The thermal reflective lining captures your body’s heat and efficiently adds warmth with virtually no added weight or bulk — an easy warmth upgrade for backpacking, overnight paddling trips or adventure touring. 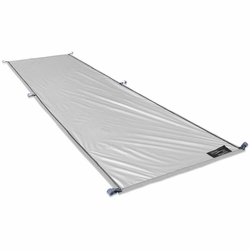 The lightweight, packable Cot Warmer easily attaches to the underside of your cot with six elasticized hooks. Stuff sack included. Packed dimension: 5 x 7"